I feel like a bit of an outlaw having purchased a tube of hemp hand cream and I wonder, how is this not banned in Kuwait!? Kuwait is downright conservative and to find hemp products sold just makes my mind boggle. Anyway, despite my combination to oily skin, my hands (and my feet for that matter) tend to get dry rather quickly and as luck would have it, they are the driest when I don't have any hand cream on hand. Yes, I meant to say hand twice there. The Body Shop do a wide range of different scented hand creams and and the sales assistant mentioned that their hemp hand cream was the best of the lot for the driest of hands. Its one of their best sellers too! Now, it doesn't smell pretty and it has a very organic, natural scent to it. Now, that's just me being nice. It smells like pond water and I'm almost obsessed with sniffing my hands every now and then to just agree with myself about how bad this smells. Definitely not everyone's cup of tea. I dislike the packaging too. 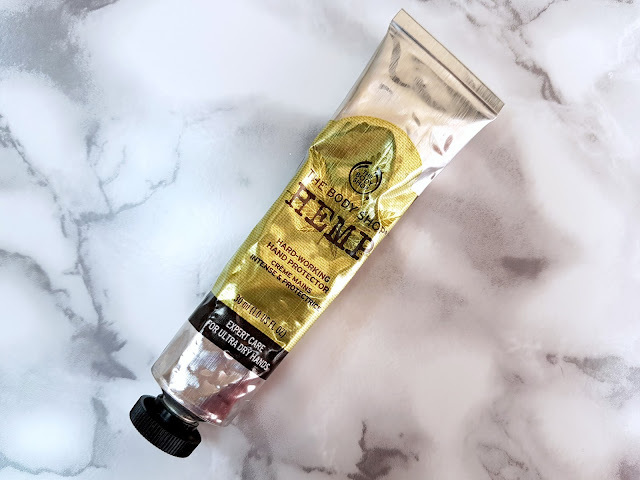 The hand cream is packaged in one of those metallic ointment style tubes that will keep on pushing out the product if the cap is off. You're basically in a race against time to get that cap back on ASAP. Oh, and lets not forget that cap! The rivets inside the cap are tiny! It is next to impossible to align the cap perfectly and having the hand cream on your hands makes an already difficult feat even more challenging! Though, scent woes and the awful packaging aside, I love this hand cream for its moisturizing properties. The consistency is thick and creamy and the formula is ultra moisturizing without being greasy. Eliminates any dryness in seconds! It does take a little to work the cream into your hands, give it a minute or two, and you'll have the softest hands and probably the closest you'll ever get to weed here in Kuwait. These hand creams come in two sizes, but I picked up the dinky 30 ml as its more handbag friendly. The Hemp Hard-Working Hand Protector (as its officially called) will set you back just 2KD and is a definite handbag essential. Hey Linda! Have you tried out any of The Body Shop hand creams? Good to see you here.